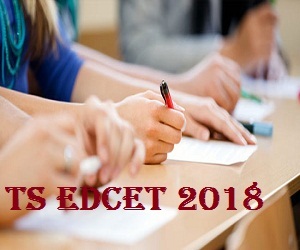 TS EDCET 2018 Telangana State Education Common Entrance Test (TS EDCET) is a common entrance exam for admission into B.Ed regular course in colleges of Education present in Telangana. 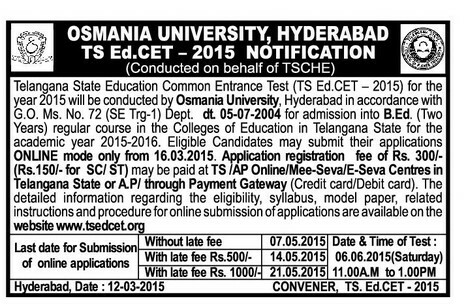 TS EDCET entrance exam is conducted by Osmania University, Hyderabad on the behalf of Telangana State Council of Higher Education (TSCHE), Hyderabad. According to a press release issued by the Telangana State Council of Higher Education(TSCHE) , the notification for TS-Edcet shall be released on 15 March , 2018. Osmania University will conduct the TS-Edcet on behalf of TSCHE in online mode on May 31 and June 1, 2018 from 10 am to 12 pm and 2.30 pm to 4.30 pm respectively. Below mentioned dates are tentative. On the release of official notification this article will be updated. 3) Candidates with degree B.A/B.Sc/B.Sc (Home Science)/B.Com/B.C.A/B.B.M and with minimum 50% of marks are eligible. For SC/ST/BC/PH, it is 40% of marks. 4) Candidates with 55% of marks in B.E/B.Tech degree with mathematics/science as one of the subjects are also eligible. 5) Age Limit: Candidate should have completed 19 years of age. 5) Each question carries 1 mark. 7) Part-A will be General English and Part-B will be General Knowledge and Teaching Aptitude. 8) Candidate must choose a subject for Part-C of question paper from mathematics, physical sciences, biological sciences, social studies, English subjects. a) Online Payment using Credit/Debit Card/Net Banking. TS EDCET 2018 Applications will be received through online only. TS EDCET 2018 Application form will be available from 2nd week of March 2018 tentatively. 1) Visit the official website and pay the application fee. Candidate can download the hall tickets from the official website of TS EDCET 2018. Hall tickets will be issued from 3rd week of May 2018 tentatively. Hall tickets will contain information regarding candidate and test date, time and venue. Candidate has to download the Hall Ticket from the website only. The qualifying percentage of marks in the Entrance Test is 25% i.e. 37 marks out of total marks. There will be no minimum qualifying marks for S.Cs & S.Ts for ranking. There will be no minimum qualifying marks for women in Physical Sciences/Mathematics methodologies. Candidate can get the TS EDCET 2018 results from the official website of TS EDCET 2018. Results will be announced on 2nd week of June 2018 tentatively. Rank card will be made available in the official website after result announcement. Candidate has to download the Rank Card from the website only. 1) Candidates will be ranked in the order of merit on the basis of marks obtained in TS EDCET examination. 2) When there is a tie in total marks, Part-C marks will be taken into account to decide relative ranking. 3) In case of further tie, the marks obtained in Part-A will be taken into account to decide relative ranking. 4) In case of candidates getting equal marks in each of the parts of the test paper, they shall be bracketed for the purpose of award of rank. 5) At the time of admission into the course, age shall be taken into consideration for relative ranking among the bracketed candidates and the older candidates shall be given priority. Candidates will be called rank-wise for counselling procedure. Candidates need to register and pay non-refundable counselling fee Rs 500/- (Rs 250/- for SC/ST category). There will be certificate verification and candidates have to submit the Xerox copy of certificates. 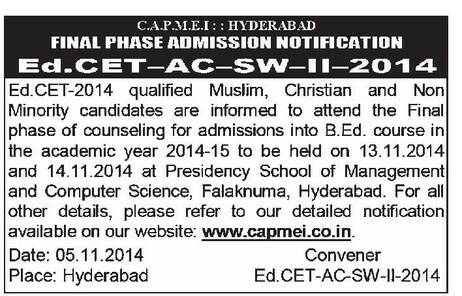 After the counselling procedure, all candidates have to choose the colleges through web options. 1) The Convener, TS EDCET reserves the right to reject the application of any candidate at any stage. 2) Any change will not be permitted to be made in the application after its receipt by the Convener. 3) The Candidate should preserve the hall ticket to produce it at the time of test and later at the time of entry into the course. 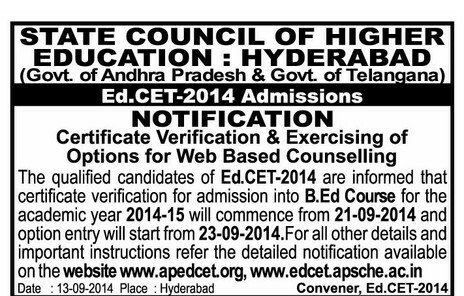 4) The appearance at TS EDCET does not entitle any candidate to be considered for entry into the course automatically. 5) Candidate will not be permitted into the exam hall after 11 AM on the date of entrance test. 6) All disputes arising out of any matter concerning TS EDCET shall be subject to the jurisdiction of the T.S/A.P. High Court. 7) Candidate has to download the Hall Ticket & Rank Card from the website only. 8) Application will be rejected if it is found incomplete/fail of eligibility conditions/false information in application. 9) Candidate will not be permitted into the exam hall without hall ticket. 10) Request for re-totalling or revaluation or personal identification of scripts will not be entertained.